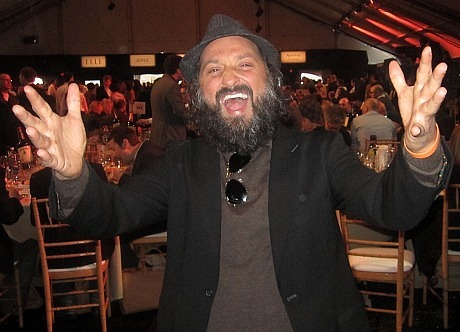 No reason, I just love this shot of Thierry Guetta, aka Mr. Brainwash, from yesterday’s Spirit Awards ceremony (snapped by Jeff Wells). Boy, Howie Mandel’s really let himself go since they cancelled Deal or No Deal. It’s like…I change Elvis, he had a guitar, I put in a toy from Fischer Price. You know, a toy…from Fischer Price. I wonder if thats an MS Society bracelet he’s wearing…random observation. Watched “Exit…” last night for the first time, great film. We all had those bracelets, actually. Got them on the way in. I thought the movie was unfair to MBW. Which is part of the movie, I guess. It’s nice to see an artist realize himself, right? I wish they would release Thierry’s first film about the graffitti artists.